Earth is one of man's oldest building materials and most ancient civilizations used it in some form. It was easily available, cheap, strong and required only simple technology. In Egypt the grain stores of Ramasseum built in adobe in 1300BC still exist; the Great Wall of China has sections built in rammed earth over 2000 years ago. Iran, India, Nepal, Yemen all have examples of ancient cities and large buildings built in various forms of earthen construction. It is significant that the oldest surviving examples of this building form are in the most arid areas of the world. The strength of unstabilised earth walls comes from the bonding effect of dried clay. If this becomes wet the strength is lost and indeed the wall will erode or even fail completely. Different countries have different approaches to this problem. 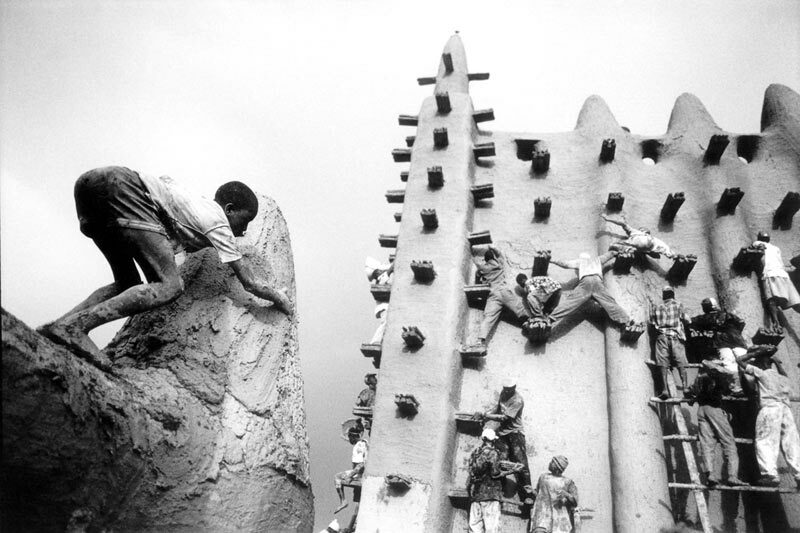 In Mali the Grand Mosque of Djenne is given a new coat of mud plaster each spring to replace the coating washed away by the rainy season (click thumbnail for large image). 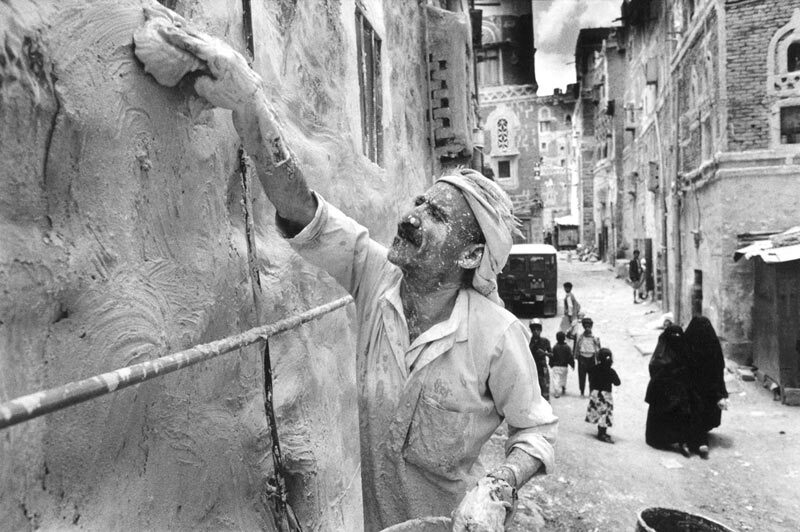 In the Yemen specialist workers burn limestone to make hydraulic lime with which they plaster their earth buildings (click thumbnail for large image). In England there is ample evidence of earth’s use as a building material, as around 60% of scheduled “ancient monuments and archaeological sites” are constructed of earth or have earthworks associated. But it became regarded as a material of limited durability and thus inferior to more permanent materials, such as stone or fired clay bricks. Consequently, within the last few centuries, it has most commonly been used for workers cottages, barns and perimeter walls where cost was more important than longevity. This is evident from the fact that fewer than 2% of the 450,000 listed buildings in England are made of earth. The modern version of earth building, which is stabilised to solve the longstanding problem of solubility, has developed through an interesting set of international connections. An English trained Architect and Engineer, George Middleton, worked at the Experimental Building Station in Sydney in the late 1940’s. Looking for methods of building low-cost housing, he experimented with stabilising earth and produced a publication from the Station: “Bulletin 5, Earth Wall Construction”, which eventually became a standard reference for earth building in Australia. In 1953 he published a book: “Build Your House of Earth; A Manual of Earth Wall Construction”, which has been reprinted several times. Middleton advised the Israelis on low-cost housing and their developments were published in "Soil Construction - Its Principles and Application for Housing" in 1957 by S. Cytryn. This publication, which introduced the term Stabilised Rammed Earth, came to the notice of the architect Tom Roberts and artist Giles Hohnen in 1975 in Western Australia. Their interest in earth-wall building started with the search for an aesthetic and cost effective wall material for a new Winery at Margaret River. Western Australia at the time was a “brick and tile” state, with the only other option, timber frame, viewed as a “low rent” building material, actively discouraged by local councils. This, combined with the 1973 OPEC oil price hikes (prices quadrupling between 1973 and 1974 and rose a further 150% in 1979 in the wake of the Iranian Revolution) created an inflationary period that the brick industry seemed to be cheerfully exploiting. Apart from jacking prices, they were able to dump failed experiments in brick and tile fashions on the country builders and Margaret River was facing a creeping rash of what they called “ tropical disease” houses with speckled mixes of brown, cream, white, pink and green walls and roofs. Based on Cytryn’s advice, these men took the critical decision to use local lateritic gravel and stabilise it with a low percentage of (approx 2-3% initially) cement rather than use earth with 40% clay as had been done previously in Australia. They built a shed in Stabilised Rammed Earth at Cape Mentelle in 1976 to demonstrate to the Council the durability and strength of the material, which still stands today in pristine condition unaffected by the weather. The following year the council approved the construction of the first stage of the winery and within 10 years approximately 20% of new houses in the shire were of SRE. This was the start of a SRE building boom in Margaret River, Western Australia, where within a few years, 20% of new houses were being built in this new material. At about the same time, David Eastern in the USA and Patrice Doat and Hugo Houben in France were rediscovering earth building. They initiated renewed interest in their countries and have built many buildings since, extending their knowledge and publishing excellent books on this subject.